This is a pretty cool game I am playing on my Samsung Galaxy Nexus. 2. Focus on the high roller units, like the Saskuan and the Blue Ox. Don’t invest in the smaller ones they don’t do much. 3. Use the OX as a buffer, use the porcujectors to needle them from behind defensive positions. 4. Send in the Rhinos at higher levels, that one is a real life saver. 5. Horn of Aid is a real helper because they call in random units. All four varieties are produced and bottled in Italy. The grapes are grown in the Lombardy region and the wines come from wine maker Dino Torti. All but one of the wines come in 750 ml bottles, while one is in a 375 ml bottle. What we in the U.S. call a pinot noir grape or wine, the Italians refer to as pinot nero. The three larger wines are all made from 100% pinot nero grapes. The 2006 Hello Kitty Devil Red Pinot Nero comes from the Borgogna Vineyard. Innovation describes the wine as "cardinal red with orange reflections, nose is silkish, important, ehtereal: important taste with noble recollections of wood." Innovation Spirits CEO Drew Hibbert explains that it is a classically rendered pinot noir. The pink label features a black Hello Kitty complete with horn and tails, but also with the telltale bow and a pink heart. The Hello Kitty Angel White Pinot Nero label, as one might expect, features a white Hello Kitty with angel wings along with her bow and heart. The 2008 white wine is made from free run juice. According to Innovations, "while tasting, you can appreciate the long lasting back taste and the nice body given to the wine by the grape structure." Next up is the Hello Kitty Sparkling Brut Rosé. Each bottle includes a souvenir Hello Kitty pink pendant. It is characterized as having a "light pink color, perlage fine and persistent, sweet flower scent and light spice, harmonious taste thanks to the very balanced natural sparkling with the structure." Finally, the Hello Kitty Sparkling "Sweet Pink" comes in a half-size bottle and features a more traditional Hello Kitty on the label. According to Innovations it is a "fine Sparkling Rose wine with delicate pink color, perlage fine and persistent, elegant aroma of flowers, smooth with a hint of almond." In contrast to the pure pinot noir formulas of the other Hello Kitty wines, the grape varieties for this product are described only as a "grapes blend with aromatic grapes." Wine connoisseurs will want to know that the Hello Kitty wines are all DOC certified. Lay people just need to know that they are produced in specific regions, following specific rules of production, and are of very high quality. In response to concerns about selling alcoholic beverages featuring a cartoon character that appeals to children, Hibbert told LA Weekly that, "with over 60,000 Hello Kitty SKU’s in the marketplace and at 35 years old now, she is definitely ready for more adult skewed products. I don’t think that the $15,000 dollar Hello Kitty handbags are aimed at children either." Full tasting and technical notes are available at hellokittywines.com. Retail prices range from $19.99 to $29.99 per bottle. The product is not yet available for sale online, but should be some time in April. Southern Californians can find the wines at Hi Time Wine Cellars in Costa Mesa. Hello Kitty wine aficionados can also download themed wallpapers for their phone or computer desktop on the site. best wishes to everyone! Cute countdown video! who remembers this timeless robot classic from the 80’s! Ah during the age of Mazinga there was also JEEG ROBOT! nice cool 3D rendering of it…too bad it’s not found a way to return to the big screen! HKO raised over 11,000 USD again in Helping Hearts? Inside Hello Kitty Online there was an event that resulted in real life results, a T-shirt inside Hello Kitty Online. The concept was first done with the Food for Friends were over 12,000 USD was raised, an amazing achievement in a matter of days. So what is a shirt and a bag worth? Of course the ultimate beneficiary are the orphans who receive this benefit, let’s not forget that but I was curious to analyze the "net" value of what happened, being the ever-analytical guy I am. Now I don’t know what type of shirt it is, quality wise but it looks like a sports tee out of pretty reasonable and nice material. and over here I saw a designer Tee that’s also a collectors edition where it used to sell for 63 pound sterling!! and now only 25.45 which is still almost 40 USD per shirt. site. Translated that’s about around 23-24 USD per bag. So my final estimate is that I took an average of the prices I found, taking into account and assumption of quality and brand license value at around 50 dollars per shirt and 24 dollars per bag. That means 9,150 for the shirts and 2,016 dollars per bag, you think that’s right? That’s 11,166 US Dollars according to my estimate and analysis! Merry Christmas and looking forward to the founders beta re-union. The auto update has spoken, Hello Kitty Online is being patched with some serious updates, I wonder what’s in store for all of us? Just for xxxxx and giggles. I did a Google trend on Hello Kitty Online and here is what I got. Pretty interesting, it demonstrates a significant rising interest in the game according to Google in an explosive manner. It’s still a beta but it’s fun to see/watch. What I thought was really interesting is that apparently people from Singapore like this the most! Followed by Malaysia and then Hungary?! Gmail is having a systemwide outage affecting multiple countries, and a whole bunch of its 100 million users are screaming about it on Twitter . Around 20 million people visit Gmail each day, according to Comscore, and they’re all seeing the same message. The first outages were reported at about 2 pm PST, 44 minutes ago. 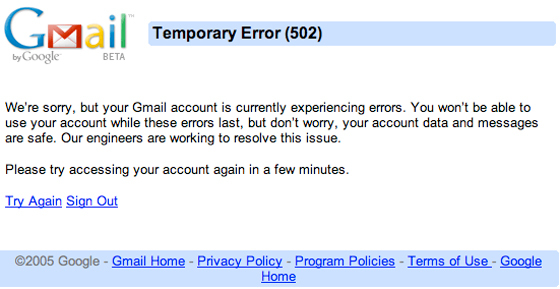 The Gmail blog is silent on the outage, instead giving readers some useful tips on customizing web clips. We’re waiting on Google for a comment on the reason for the outage, but I can’t help but suspect that my decision yesterday to abandon MobileMe/.Mac in favor of the super-stable Google apps may have been a factor. Sometimes Google does things just to spite me. Meanwhile, the productivity of 20 million people worldwide just spiked upward. Thanks to Todd Garland for the creative image. To this very daring cosplay! Doesn’t get much more daring I’d say, but the semblance is uncanny!